Linda was up at 5:45 AM and off to the bakery at 6:15. I was up at 7:45 AM and skipped breakfast and coffee. I put on Weather Nation and took stock of the forecast while I folded the clean laundry. I took a shower, got dressed, made a cup of tea, and had a small glass of orange juice to wash down my pills. My main objective for today was to get the bus fueled which would also serve as a test run. The forecast had the chance of rain increasing through the morning and heading towards certainty by early afternoon, albeit intermittent and not very intense. I wanted to take care of the fueling before the rain settled in but wanted to wait long enough for the temperature to rise so I set 11 AM as my target departure time. Before I moved the bus, however, several things had to be done. First on the list was turning on the electric block heater for the main engine. It wasn’t cold enough for this to be necessary but having the oil warmed up a bit never hurts, especially with the straight 40 weight oil. It helps the engine crank over and get oil to the bearings more quickly. The living room and kitchen in the bus looking aft from the cockpit. New flooring, new seating, new desk, new refrigerator, new slide-out pantry, and new window shades (rolled up). Next was simply cleaning up the interior so the coach could be safely moved and nothing would get broken. I gathered up all of the tools and materials that I no longer needed and moved them into the house and garage. I then installed the solid brass door stop on the bottom of the pull-out pantry. Finally I mounted the two aluminum angles to the inside of the refrigerator alcove, one by the freezer door and the other by the fresh food door. The angles were 1/2″x3/4″ with holes drilled in the 3/4″ flange for #6 SR self-drilling wood screws. I had carefully countersunk (chamfered) each hole so the screw head would be close to flush with the surface of the flange. The aluminum was only 1/16″ thick so I had to be careful not to overdo it. With the freezer door open I set the 1/2″ flange against the face of the refrigerator case (on the side opposite the hinges) and held the 3/4″ flange square to the side of the alcove. I used a #5-6 self-centering VIX drill bit to drill three holes about 3/8″ deep and installed the 5/8″ #6 screws with a manual screwdriver so as not to over torque them. I repeated the procedure for the second angle which was longer and had five mounting holes. 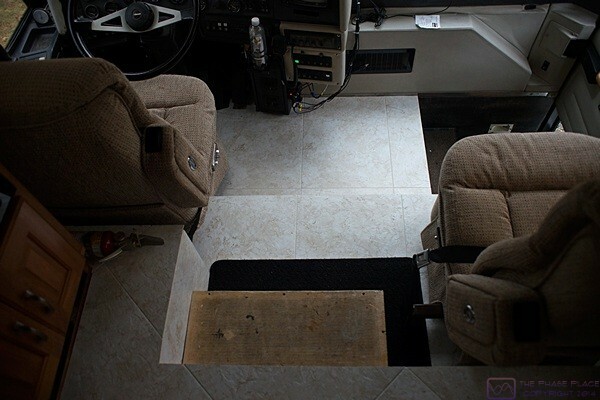 The new floor in the cockpit of the bus. I had a little spare time so I drove my car up and down the new driveway to compact the gravel. I won’t drive the bus on this new driveway until next year but it already supports the cars very nicely and the weight of the Honda Element was sufficient to knock down some of ridges and compact the surface. I checked all of the tire pressures and they were OK so I did not have to get out an air compressor and adjust them. I will have to do this next week before we leave, however, as the temperatures will have cooled off significantly by then. Around 11 AM I turned on the coach batteries and opened the auxiliary air supply valve for the engine accessories. I turned off all of the electric heating elements and made sure the inverter was turned on and then started the main engine. I let it run for one minute and then switched it go high idle. While the engine was warming up and the air pressure was building I shut off the shorepower, disconnected the power cord, and stowed it. I pulled out at 11:15 AM and headed for the Mobile Truck Stop at exit 122 on I-96, approximately 22 miles from the house. While there are a couple of closer places I could get fuel this truck stop has very good egress and is fairly busy, which means the fuel is being turned over frequently and is thus relatively fresh. The drive is a mix of Interstate and Michigan Highways with a few stoplights and a couple of miles of dirt road, so the bus has to run up and down through its gears. It is also a long enough round trip to get the engine up to normal operating temperature under load. I estimated that the tank would take on about 120 gallons of diesel fuel so I added two bottles of Stanadyne Performance Formula and one bottle of Stanadyne Lubricity Formula. The tank started whistling at 112 gallons, which meant it was getting full. I added the last few gallons by controlling the flow manually and stopped at 119.990 gallons, so my 120 gallon estimate was pretty good. I paid for the fuel and got a free beverage to go with it. I had some occasional light rain on the drive out and on the drive back but the trip was otherwise uneventful. I was back at 12:45 PM, parked the coach, and started the auxiliary generator, which I had not done for several months. To load the generator I turned on all three electric toe-kick heaters, the engine block heater, the Aqua-Hot electric heating element, and front bay electric heater. I let it run for 90 minutes with an average current draw of 25 Amperes on each leg, which is about 35% of its full load capability. I got the shorepower cord out and connected it but did not turn it on. As long as I had water and air pressure I flushed the toilet and then ran a little water through the various faucets in the coach. I set a rubber door mat under the drain for the fresh water tank to keep the water from drilling a hole in the driveway and then let the tank drain slowly. While it was draining I got the long fresh water hose out and connected it to the spigot on the front of the house and the water port for the coach. With the fresh water tank empty I checked that the outside water spigot was configured to provide filtered/softened water. I closed the drain valve, opened the fill valve, and opened the valve at the house. I then went in the house, set a timer, and had a bite of lunch. I had a phone call while I was driving back from the truck stop but did not answer it. The caller left a message so I listened to it and then called him back. Kevin Stufflebeam, from the southwest part of Michigan, had a 1995 Marathon Prevost conversion with a non-functioning Webasto system. It turned out that he had the system worked on by a company in that area and the guy from the company had called me during the summer. They got my name and contact information from Josh Leach at Coach Supply Direct, with my permission. The fresh water tank has an overflow tube so that is how I knew it was full. I closed the fill valve on the bus, closed the spigot valve at the house, and then opened the fill valve to relieve the pressure in the hose. Sure, it was a lot of back-n-forth, but it eliminated the spray that occurs when unscrewing a fitting on a pressurized hose. It also makes the fitting easier to unscrew. I removed the hose from the coach and then from the house. The spigot is about four feet higher than the driveway so I pulled the hose up towards the spigot, allowing it to drain as I coiled it up. Once it was coiled I connected the two ends together, put it back in its storage tub, and put the tub back in the front bay. Linda called at 4:30 PM to say she was on her way home. It had been raining, off and on, all afternoon so I took about 45 minutes to drive on the new driveway with my Honda Element and compact it even more. But first I got the metal toothed rake and evened out the few remaining ridges and valleys. Besides going up and down the driveway I drove across it at various angles at both ends. Most of the driveway has fresh topsoil along both edges, which is soft and has grass seed and straw on top of it, so I stayed off of those areas as they definitely should not be compacted. The end of the new driveway by the house ties into our concrete driveway and some solid, undisturbed lawn with a flare. The far end, which ties into the street at our third culvert, is much wider (to allow the bus to make the turn), relatively flat, and ties in to solid, undisturbed lawn. The concrete, road, and undisturbed lawn allowed me to drive beyond the edges of the driveway in these areas and go across them at various angles. Any kind of weather always slows commuter traffic and Linda did not get home until 6 PM. It had been a long day for both of us and she just wanted to relax for a while. She opened a bottle of Barefoot Moscato and poured each of us a glass. For dinner we had mock oriental orange chicken with reheated frozen broccoli and white rice with soy sauce. It was an easy but very tasty meal. After dinner I finally settled in at my desk to finish updating the FMCA Freethinkers Chapter roster, financial statements, and minutes from the 2014 annual meeting. Linda reviewed the financial statements and helped me reconcile them to the bank statements. Once we were satisfied they were accurate I saved everything as PDFs, uploaded them to our Dropbox, and sent the folder link to the members via e-mail. We then headed to bed and watched the last episode of The Brain on Detroit PBS. Linda went to sleep and I wrote for a while, finally turning the light out at 11:30 PM. This entry was posted in Accounting, Bus Projects, Family-Friends-Home, FMCA, FTH, PBS, Professional, Projects, RV-Travel, Weather, Wine and tagged driveway extension, FMCA FTH Ch, FMCA FTH financial statements, FMCA FTH roster, fresh water tank, fueling (H3-40), interior remodel (H3-40), Josh Leach (Coach Supply Direct), Kevin Stufflebeam, Metropolitan Baking Co, Mobil Truck Stop (I-96 MI), mock chicken w/ orange sauce (Gardein), Moscato (Barefoot), PBS (Detroit MI), pull-out pantry door stop (H3-40), refrigerator retaining angle, Stanadyne diesel fuel additive, tire pressures, travel prep (H3-40) on 2015/11/18 by BRF. We were up at 8 AM and had breakfast but I did not take the time to make coffee. I gathered up the laundry and started a load. I then headed to Lowe’s to buy an outlet strip that I could easily hardwire. I looked at angle iron to support the upper back edge of the interpedestal desk cover at the wall but did not buy any. The iron has holes and slots manufactured into it that I thought might allow me to adjust its location vertically without having to move the location of the screws. Alas, the slotted openings were horizontal rather than vertical. Linda was cooking a batch of granola when I got home and made a pot of coffee. I decided to tend to some travel preparation items before getting back to work on the remodeling project. I wanted to check/adjust the tire pressures while it was still cool. The tires were all down about 1.5 PSI, which was very good given how long it has been sitting. I used the new 6-gallon air-compressor to bring them up to the pressures I like to run and it worked OK. I will have to pause a little more often while it re-pressurizes but it is less than half the size of the 15-gallon DeWalt and will travel with much more easily. My next task was to unload the front bay which I did while Linda continued to work on our food for the week. We find it much easier to deal with food at rallies if she “cooks ahead” and “reheats to serve.” I set everything in the driveway in front of the bus and tried to sort it into two groups; things were staying home for this trip and things that were going with us. I then opened the drain valve on the fresh water tank, which goes through the floor of the water bay, and let the water run onto a container lid so it wouldn’t dig a hole in the gravel driveway. I was getting ready to deploy the fresh water hose(s) when I noticed that they were in need of some serious cleaning. Linda agreed to take care of that and cleaned their storage tub too. Ditto for the waste water (sewage) hoses and their storage tub. Her taking on this task allowed me to return to working on the installation of the desk. I had a 12″ long piece of 1/8″ aluminum angle and decided to use it to support the upper back edge of the interpedestal shelf/cover. I drilled and countersunk five holes in one of the flanges. Linda finished cleaning the hoses and then got our wireless thermometer from the house. It has a base thermometer and two wireless remotes so she put one remote in the freezer and the other one in the fresh food compartment. We wanted to monitor the temperature and dial it in to where we needed it before loading the refrigerator with food. The stacked mending plates used to create a tongue-&-groove alignment system between the center cover and both the left and right desk pedestals/bases. I removed the interpedestal cover and set the left pedestal aside so I could complete the AC wiring connections. I mounted the outlet strip to the wall centered between the two pedestals and about two inches below the level of the underside of the plywood that will support the Corian top. The outlet strip had a 15 foot cord. I determined how much of that length I needed to get through the right pedestal and forward along the wiring chase to where the other wires were located. I cut off the extra length, routed the power cord into the right pedestal at the left upper rear corner, down the inside left rear corner, and out the left end of the upper base. From there it ran forward to the other wires where I connected them. I turned on the circuit breaker and then turned on the outlet strip. The switch lit up, indicating the presence of 120V AC. I used my Etcon tester to check the duplex outlet by the passenger seat. It also had power so the wiring was good. I set the interpedestal shelf/cover back in place, aligned with the right base, and then aligned the left base to it. I checked the distance from each end of the base to the HVAC duct and adjusted it to be the same. We then adjusted the position of the left pedestal until we were satisfied with the alignment with the interpedestal cover. We checked the alignment of the front top edges of the pedestals with a 6′ metal ruler. Everything looked OK so I secured the pedestal to the base using two screws that will be hidden by the laser printer in normal use. 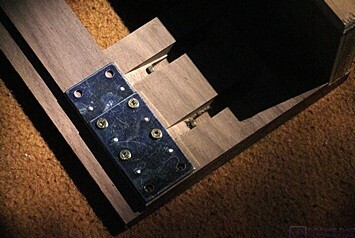 I needed to screw the pedestal to the wall in the two upper corners to minimize the visibility of those screws. It was not flush to the wall at those points so I used a shim in the upper right. We will have to cover the vertical gap at the left rear with molding. 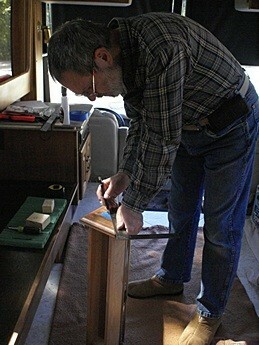 Bruce finds the center of a drawer front by finding the point where the diagonals of the face intersect. The handle mounting holes were located horizontally 1-1/2” to either side of this center point. We put the removable plates back in the bottom of each pedestal. I drilled the holes for the pulls in the four desk drawers, installed the pulls, and put the drawers back in the desk. To find the correct location for the holes Linda suggested that we put a piece of painter’s tape in the center of the face and then draw a small segment of the two diagonals to find their intersection. For the two small drawers that was all we needed as they got single knob style pulls. For the two larger drawers we needed to locate the holes 1-1/2″ to either side of the center on a line through the center parallel to the top and bottom edges. I measured carefully and I think we did a pretty good job. Sometime during the morning I texted Jarel the dimensions for a 3/4″ thick piece of walnut 1-7/8″ high by 34″ long to use as a face for the edges of the three layers of plywood under the refrigerator. He texted back and said “no problem” which lead to an exchange of a dozen e-mails clarifying just exactly what I wanted. I did not mind, better that than assumptions that result in wasted time making parts that don’t fit. Jarel is an experienced cabinet maker and is meticulous in his work. He knows all the questions to ask about things I did not specify and does so before cutting any wood. Linda was still trying to prepare our food for the rally as there will be very little of the included food that we can eat. She made a grocery run while I returned to emptying out the front bay of the bus. I plan to leave most of the stuff that was stored in that bay at home so Josh has access to the ceiling to see if we can through-bolt mount the two captain’s chairs in the living room. I might also store all of the GLCC stuff down there as Linda will be coming down on Wednesday in the car with the cats and we want to minimize the amount of other stuff in the car. I thought about sanitizing the fresh water system by using the 12V DC water pump and the winterizing valves/tubes to draw a dilute chlorine solution from a bucket and pump it through the fresh water pipes. I decided against it based on available time and higher priority items that needed to be done. I connected the clean fresh water hoses to the coach and started filling the tank. I checked that the fuel polishing pump was off and checked the air springs and latch on the generator. I made a mental note that the aft air springs (front of the Yanmar diesel engine) needed air and made sure the slide tray was latched in place. I was going to start the generator and let it power the air conditioners but decided to forego for now that as well. We had unlatched and removed the towbar from the bus receiver earlier in the summer. I used one of our hand trucks to move it over by the car. I put the passenger side rear seat down and loaded the towbar in behind it along with the bag that holds all of the other pieces. That left plenty of room for the two cat carriers, litter tray, and any miscellaneous things she may bring along on Wednesday. We put the mattress back onboard and Linda made the bed, but forgot the electric heating pad. Linda did some cleaning and then we loaded clothing and food. Computers, cameras, and other technology will go on first thing tomorrow morning. We then got the various GLCC items out of the garage and staged them by the passenger side of the bus. I loaded our personal items onto the driver’s side half of the slide tray and loaded the GLCC stuff onto passenger side half. Our goal was to be done by 5 PM but it was 6 PM when I finally had the pressure washer ready to use. It took me a little over an hour to spray the car and the coach and I wrapped up for the day at 7:30 PM. We had seitan stroganoff for dinner with the 2013 Egri Merlot and had watermelon for dessert. It was another long day but we got a lot accomplished and most it did not require me to work on my hands and knees, for which I was grateful. 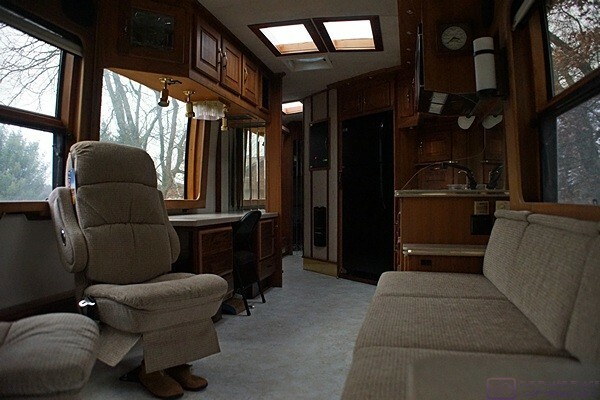 This entry was posted in Bus Projects, Family-Friends-Home, RV-Travel, WFPB, Wine and tagged 2013 Egri Merlot, AC wiring (H3-40), alignment plates (desk), bathroom door (H3-40), Blue Ox tow bar, desk installation (H3-40), drawers (H3-40), fresh water hoses, fresh water tank, GLCC Surplus & Salvage Rally, homemade granola (WFPB), interior remodel (H3-40), Jarel Beatty Cabinetry (Logansport IN), Lowes (Howell MI), making granola (Linda), rally food, repacking bays (H3-40), RhinoFLEX sewer hose, RV mattress, RV pressure washing, seitan stroganoff with rice (vegan), tire pressures, vegan, watermelon (WFPB), wireless thermometers (H3-40 fridge) on 2015/09/14 by BRF. We were up around 8 AM. Linda took a shower after which I started the last load of laundry while she made coffee. We had our usual granola breakfast. When the washer finished I trimmed up my beard and shaved and then took my shower while Linda moved the wash to the clothes dryer. Once we were both dressed we got very busy loading the bus and preparing it for travel. I put on my work clothes and selected my clothes for the week. Linda took care of loading the bus while I attended to preparing it for travel. The preparations went something like this. First I loaded our GLCC banner, flags, T-shirts, door prizes, tools, and our new 6 gallon pancake style Porter-Cable air compressor into our Honda Element. I turned on our TireTraker TPMS monitor and plugged in the power cord for the TPMS repeater which is installed in the passenger-side rear corner cabinet in the bedroom. I then got out our long fresh-water hose, connected it to the faucet on the front of the house, ran it under the bus, and connected it to the fresh water inlet. I got a mat to put under the fresh water tank drain and emptied about 40 gallons of water that had been in the tank since we got home on Friday, April 24. I closed the drain valve and then opened the fresh water tank fill valve. At 3.4 gallons per minute the 120 gallon fresh water tank takes about a half hour to fill. While that was happening I got our DeWalt 15 gallon upright tank air compressor out of the garage and rolled it over to the front of the bus (it has wheels). I got our long extension cord out of the front bay and ran it from the front porch outlet to the air compressor. I then got the air hose out of the bay where it was stored along with the air chuck, and digital tire pressure gauge, and retrieved a knee pad and slip pliers from two other bays. I removed the TT TPMS sensor from each wheel in turn, checking and adjusting the pressure as I went. I always do both dual drive tires on each side at the same time to make sure they are the same. The inside duals have valve stem extensions so I use the pliers to keep them from loosening while I unscrew the sensor. The two front tires were at 111.5 and 112.0 PSI, both above the minimum required 110.0 PSI, but I brought them up to 115.0 PSI. I like to run the tires 5 PSI over the correct pressure to allow for changes in overnight low temperatures and to provide some margin against slow leaks. The two tag axle tires were around 82.5 PSI so I reset them to 85.0 PSI. The four drive tires were around 92.5 PSI so I brought them up to 95.0 PSI. By the time I was done with the tires the fresh water tank was full so I shut off the water and stored everything back where it came from. I then pulled the Element around behind the bus. Everything was on board by this point except the cats, the cat tree, and us. We hooked up the car for towing and checked all of the lights. I switched on (connected) the chassis batteries, opened all of the air valves, switched off the Aqua-Hot engine preheat pump and diesel burner, started the main engine, and switched the suspension to drive mode. While coach was airing up I pulled the 50 A shorepower cord and stowed it away. Back in the house we put the cats in their carriers and left them in the front hallway while we took their “tree” out to the bus. We then brought them out, locking the house behind us, and put them on board. Both cats immediately went under the front passenger seat which is their “go to” spot while the coach is moving. All of what I have just described took place with intermittent light rain. We could not recall the last time we had to load the motorcoach, or our previous motorhome, in the rain, but we agreed that having it parked with the entrance door opposite the sidewalk to the front door of the house made it much more convenient. Still, it was reminiscent of the “age of camping,” a time in our lives when we camped frequently in a tent with our pre-teen children. While not a constant companion, rain was a frequent visitor on these outings and yet it never deterred us from going and never lessened our enjoyment. Indeed, we tried to show our children the special beauty of a hike in a Michigan woodland in the rain or the power of standing near the shore of a Great Lake during a storm. Cooking was more of challenge, to be sure, but we had a screen room in addition to our tent and made preparing and eating meals part of the adventure. Our friend Chuck said to me once that we were different from most of the other Prevost owners he and Barbara know because we were “campers.” True enough, although what we do now hardly seems like camping to us. 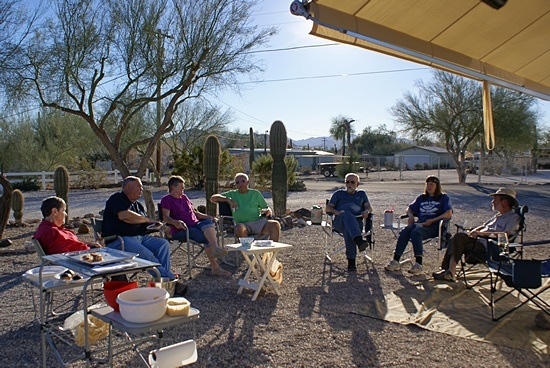 Still, we are quite comfortable with having the furniture and flooring removed from our motorcoach, sitting on lawn chairs instead, and dining at our fold up plastic side table. We pulled out of our driveway at 12:30 PM and made our way slowly down our muddy, pot marked dirt road to N. Hacker Road. It was nice not having to worry about scratching the side of our rig as a result of our tree trimming raid late last night. Instead of taking our usual route north to M-59 we went south on Hacker which got us on pavement a short distance later. Most of the trees on the west side of S. Hacker Road were trimmed up high enough but just before getting to Grand River Avenue we got clunked. Our front OTR TV antenna is the highest thing on the bus. It is centered side-to-side near the front and probably took the branch. I should check it for damage the next time I am on the roof. We went south on Grand River Avenue towards Brighton and less than a mile later took the entrance ramp to I-96 west. Twenty-three miles later we took exit 122 and stopped at the Mobil Truck Stop for fuel. We were at 3/8ths of a tank and rather than fill it we only put 80 gallons on board. That was enough added fuel for approximately 480 miles and our round trip to/from the RV rally would be less than that. We will not be using the coach for a while after this week and it is not clear what the best thing is to do relative to long term storage. Filling the tank with fuel minimizes the air in the tank and thus the opportunity for moisture to condense out. 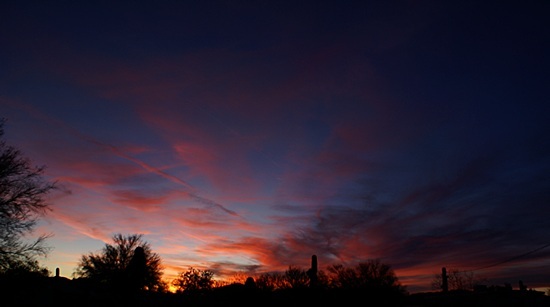 Moisture is a bad thing in diesel fuel as it enables the growth of algae. I use a biocide additive to inhibit that growth, especially at a fill up just before it is going to sit for a while, and we have a fuel polishing pump to slowly circulate the fuel and remove water and other gunk while the coach is sitting. That would seem to solve the problem, except for the fact that it is not ideal to store diesel fuel any longer than necessary before using it. I suspect that we will fill the tank at the Mobil Truck Stop just before returning home, using an extra dose of biocide, and then run the fuel polishing pump all summer. We continued west on I-96 to the southwest corner of Lansing and then exited onto southbound I-69. It continued to be overcast with a noticeable wind out of the east. We thought we were done with the rain but continued to get an occasional sprinkle. We exited I-69 at US-12 and headed west through Coldwater and the southern tier of Michigan counties. US-12 is a good 2-lane highway with some left and right and some up and down, sometimes at the same time. It is a fun drive with nice scenery and passes through three other small towns: Bronson, Sturgis, and White Pigeon. We eventually left US-12 onto Old 205 (M-205) and a couple of miles later entered Indiana where the road became SR-19 (IN-19). A few more miles and then left (east) on CR-4 and a mile later we pulled into Elkhart campground at 4:10 PM. Linda checked us in and then we drove to site 738, leveled the coach, and shut down the engine. We went through as much of normal arrival routine as we could, setting up the cat tree, two folding lawn chairs, and our plastic folding side table. Linda got our WiFi Ranger connected to the RV Park WiFi and got online with her iPad while I used mine to write. We snacked on pretzels while we were traveling and by 5:30 PM we were ready for dinner. Linda made a simple salad and then cooked a couple of vegan “burgers” and served them with the remainder of the potato salad she made the other day. We went for a walk around the campground after dinner and thought we spotted Nick and Terry Russell’s Winnebago Ultimate Advantage motorhome but did not see any sign of them. The rig had Florida plates but there was a new Honda SUV parked in front. The last time we saw them they had a Ford Explorer but I have not been keeping up with Nick’s blog so they could have gotten a new car without us knowing about it. When we finished our walk we unhooked the car. I forgot to pack my toothbrush so we drove back to the intersection of CR-4 and SR-19 where there is a CVS, a Walgreen’s, and a Martin’s supermarket. The CVS was the most convenient, and we have a discount card there, so we bought my toothbrush and picked up some pistachios and almonds on sale. Back at the coach we had small glasses of Moscato and some red grapes. It’s been a very physical week for us and by 8:30 PM Linda was ready to lie down and watch a little TV. The local PBS station was in the middle of a fund raiser (they probably all were nationwide). That usually means vintage (nostalgic) musical performances and tonight was no exception with a reunion concert by the BeeGees (Brothers Gibb). Although best known (to my generation) as the “sound of disco,” personified in the movie Saturday Night Fever, the BeeGees performed actively for many years and have a very deep catalog of surprisingly familiar songs. This concert was filmed in Las Vegas in 1997 and several of the brothers have since passed away. Good music is good music but popular music tends to take on significance for individuals based on where they were and what they were doing at the time it became popular. The BeeGees, like Ernest Hemingway, we’re so popular that it became popular to put down the music of the disco era. Thankfully that time has passed (in both cases) and we can remember fondly “the age of disco” and enjoy the art and artists for what they are, enjoyable and talented. The BeeGees concert was followed by Motown 25. I was 12 in 1964 and although I studied and played classical music I was definitely listening to popular music on the radio and that included the new Motown sound. I was enjoying this concert as well but it was late and even I get tired and sleepy so I turned it off and went to bed. This entry was posted in FMCA, GLAMA, GLCC, Indiana, Michigan, RV Rally, RV-Travel, Wine and tagged 6 gal air compressor (Porter Cable), AntennaPoint.com, Aqua-Hot engine preheat, BeeGees concert (PBS), camping in the rain, CR 4 (IN), CVS (Elkhart IN), diesel fuel storage (H3-40), diesel fuel treatment (H3-40), disco era, Elkhart CG (Elkhart IN), FMCA GLCC Ch, fresh water tank, Grand River Ave, I-69 (MI), I-96 (MI), IN-19, M-205, Mobil Truck Stop (I-96 MI), Moscato (Franzia), Motown concert (PBS), OTA TV, PBS fund-raiser, rainy weather, S. Hacker Rd, tire pressures, TireTraker TPMS, travel prep (H3-40), US-12 (MI), WiFi Ranger Mobile Ti on 2015/05/31 by BRF. The boots may have been made for walking, but the wheels were made for turning and it does not make much sense (to us) to own a motorhome and not use the motor to move the home around at least occasionally. Checkout time at Williston Crossings RV Resort is nominally 11 AM. We were planning to leave by then, but a call to Suncoast Designers at 9 AM caused us to push our departure time back. They suggested we not arrive until about 4 PM to make sure we had a place to park with hookups. That put our departure time target at 2 PM. We walked up to the office to make sure this would be OK. It was; we have been here a long time and been good residents, and no one was scheduled to go in to “our” site today. Given some extra time we had not planned on, we went for one last, long walk around the RV resort. How different it looked and felt. The resort is turning over from long-term winter/seasonal use to short-term summer/vacation use and there were many empty sites. Eighty-nine rigs left yesterday. Many were Carriage 5th wheels that were part of the 70 rig Carriage Travel Club rally that was here all last week. But some were winter seasonal residents who have been dribbling out since April 1st and will continue to do so into May. We were not the only rig pulling out today. Our other neighbor, Sharon, is leaving this coming Sunday. A few rigs were pulling in, of course, but the departures currently exceed the arrivals on any given day. When we returned from our walk I mixed up a batch of the concoction we use in the waste holding tanks (48 oz PineSol, 48 oz water, 1cup Calgon). I dumped the black-water tank and back-flushed it, followed by dumping the grey-water waste tank. I ran additional water through the drain hose and then disconnected the hoses and fittings and stowed them for travel. I reconnected the water softener and filled the fresh-water tank. Once that was done Linda helped me disconnect, clean, and stow the fresh water hoses and the water softener. We tend to forego coffee and breakfast on travel days, but had a little of both this morning as we were not leaving right away. Because of the delay in our departure we did not have lunch. To pass the time I continued with travel preparations. The last time I had the coach batteries connected I noticed that the Pressure Pro TPMS (tire pressure monitoring system) was not reading one of the sensors (PS outside drive tire). We have a repeater for this system that I plan to install in the rear of the coach someday, but for now it gets attached to the rear view mirror of the car. I took care of that task and then decided to move the car up onto the patio next to passenger side of the coach. I left the ignition on to power the repeater and connected the coach batteries to power the TPMS receiver. After a few minutes all of the tire sensors were active and the tire pressures were OK for travel. I disconnected the coach batteries and put the car back in front of the coach. At 1:30 PM we started our final travel preparations, clearing off the counters and moving stuff from the cockpit to the sofa, the bed, and the bedroom floor. At 1:45 PM I shut off the 240/120 VAC electrical power to the coach, disconnected the shoreline, and stowed it in the slide-out tray over the DS drive tires. I installed the screw-in cover for the utility port hole in the bay floor, and closed/locked the bay. I then checked the Magnum 4024 to make sure it had switched to inverter mode, which it had. Once the shore power is cut we seem to develop an increased sense of urgency about leaving. I think this is due, in part, to the fact that I do not have the ZENA power generator operational yet, so our house batteries do not get charged while we are driving. That’s OK, up to a point; the battery bank was designed to be large enough to run the inverter and power reasonable loads for a reasonable length of time. But the sooner we leave, the sooner we arrive, and the sooner we arrive, the sooner we can plug back in to shore power. We have an auxiliary power plant, of course, so we always have the option of using that if needed. The other reason we are probably anxious to leave is more psychological. Once we are completely disconnected (physically) we are become disconnected mentally, although not necessarily emotionally. We are no longer “tethered” to that spot, and that means it is time to go. I connected the chassis batteries, fired up the engine, and set the level low system to the driving position. While Linda moved the car to street I drained the auxiliary air tank using the nice dry air from the main engine air compressor. With John’s assistance we got the coach out of the site and lined up on the street. Linda pulled the car up behind the coach and we went through our procedure for hooking it up to the tow bar. We did our standard light check and found that the turn signals on the car were not working. A quick check of the connectors on both ends of the cable revealed a socket on the car end of the cable that was corroded. I used the awl on John’s Swiss Army Knife to clean it up. A recheck of the lights indicated that everything was working. After a final “goodbye” with John and Ali we were on our way. Our departure delay meant we would be traveling SSW into the sun at the hottest part of the day. The air temperature was 85 degrees F when we left, and the engine ran slightly hotter than usual, indicating just above 195 degrees F on the coolant temperature gauge, so I decided not to run the coach air conditioning. The drive to Hudson was warm, but not unbearable. A cold front was approaching the gulf coast of Florida so we had increasing cloud cover as we progressed south and west towards the coast, which helped keep the cockpit from getting too warm. We had a nice run from Williston to Hudson. We headed south out of Williston on US-41/US-27/FL-121. US-27/FL-121 split off to the west a mile south of town, made a sweeping turn to the left and then followed a nice straight line SW for 17 miles to its southern terminus at US-19. This stretch of FL-121 is straight but hilly. With the cruise control set the engine is very sensitive to hills. I always know we are on a grade, however slight, by the reaction of the turbo boost gauge and the pyrometers. Most of the rest of trip was on US-19 except for the last three miles. Traffic was light until we got to Crystal River, which had slower speed limits, lots of stop lights, and lots of vehicles on the road. It opened up a bit after Homosassa Springs, but got congested as we approached Weeki Wachee where FL-50 ends at US-19. From Weeki Wachee to just north of Hudson traffic remained slow and congested with increasingly dense commercial use on both sides of the road and stop lights every mile. Just north of Hudson we turned east onto Little Road, which immediately swung south, and followed it for about two miles to New York Avenue, where we turned west and went another mile to Labor Place, the location of Suncoast Designers. The coach ran fine, although the Check Engine Light came on almost immediately and was on more than it was off for the whole trip. That did not surprise me as we had not done any work over the last couple of months to fix the fuel temperature sensor voltage problem that is apparently setting a fault code in the DDEC II. I had hoped that the repairs we made in the dashboard wiring harness would fix the speedometer/odometer problem, but they did not; the gauge sat on zero for the whole trip. The left pyrometer (exhaust gas temperature) gauge, however, was much more responsive and tracked the right pyrometer gauge much more closely than it ever had before. It appears that the wires we repaired were for this gauge rather than the speedo/odo. Once we pulled in to Suncoast Designers we pulled to the side of the road, so as not to block traffic, and unhooked the car. While Linda parked the car I found the office and checked on parking arrangements. Suncoast Designers has at least a dozen RV sites with water and 50 A electric hookups. The only one open was a somewhat tight spot between two other large Class A motorhomes that required me to back in. The maneuver was made more difficult by the fact that the road in front of the sites had a curb on the far side and was not wide enough to allow me to swing the front end without scrubbing the front tires. I repositioned the coach so that I was turning in from the driver’s side, but Linda and I could not figure out how to get the coach into the site. The guy next to us on the driver’s side offered to help. A former truck driver, he knew exactly what to have me do. Unlike some RVers, our pride is not injured by not knowing how to do something, and we gladly accepted his help. I pulled past the site close to the front of his rig and then turned out to the passenger side, putting the coach at an angle to the open site. He had me back part way into the front of the site at that angle and then turn the steer tires full left to start to bring the coach around. He had me stop and then turn the steer tires full right and pull forward. Steer tires full left again and back up some more, then full right and pull forward. We repeated this one more time and finally had the coach lined up straight and centered between the coaches on either side without having hit either one! Linda was keeping an eye on the back of the coach the whole time (to make sure I did not hit anything) and guided me into our final position. We then leveled the coach and shut the engine down. The outside air temperature was only in the upper 70’s, but it was 90 degrees F in the coach and the outside humidity was high. In spite of having nine windows that open, the three ceiling vent fans are not very effective at cooling down the interior under such circumstances. In theory we can run all three air conditioners on a “50 A” shore service, but we have tripped breakers before when doing that. (The issue is that circuit breakers are commonly designed to only carry 80% of their rated current on a continuous basis, so two of our A/C units plus a little bit of miscellaneous load can exceed 40 A on one of the legs.) Besides, as soon as I plugged in the Magnum 4024 was going to switch to charger mode and start recharging the house batteries. I got the shore power connected and checked the Magnum 4024. It went into bulk charging mode and started charging the house batteries at 86 Amps. Since it is a 24 VDC charger, it was drawing ~1/5 that much AC current, or ~17 A, the equivalent of one of our air conditioners. The front (living room) and center (kitchen) A/C’s are on separate legs of the 240/120 VAC power supply, so we can run them at the same time. The bedroom A/C is on the same leg as the front A/C and the Magnum is on the other leg. We ran the front and center A/C’s along with Magnum and let the bedroom stay warm for the time being. Suncoast Designers provides free WiFi for customers camped at their facility, but the signal we thought was theirs indicated it was “filtered” and we had not obtained the login information from the office before it closed. We used our Verizon MiFi instead and had a good, strong signal. I had a chance to ask our neighbor (helpful truck driver guy) later, and he said the open signal was the one they were using. Although it was a weak (one bar) “g” signal, our WiFi Ranger latched on to it without difficulty. Linda needed a few grocery items and located a Publix grocery store on Little Road less than three miles from Suncoast Designer’s. As evening settled in we switched off the front A/C and turned on the bedroom unit. Linda reheated some of the leftover Sloppy Joe’s from the pot luck dinner the night before, and we had that on the skinny buns we have started using, along with a simple spinach salad and a few Fritos corn chips. After dinner Linda sent e-mails to several of our new friends from WCRVR while I checked in to RVillage and took care of a few e-mails of my own. The overnight temperature was forecast to only drop into the upper 60’s with high humidity, and with rain starting before sunrise, so we decided to leave the rig closed up and the kitchen and bedroom A/C’s on all night. We rarely do this because of the noise and because we prefer fresh air, except when it is too warm and/or too humid. Considering that we had traveled less than 100 miles and been on the road just under two hours today, we both felt like it had been a very long day. As much as we enjoyed the social life at WCRVR, it was nice to not have anything to do but go to bed and get some rest. This entry was posted in Family-Friends-Home, Florida, RV-Travel, WC-RV-Resort and tagged air-conditioning, back-in parking, Carriage Travel Club Rally, Check Engine LIght (CEL), departure day, engine coolant temperature, FL-121, fresh water tank, Labor Place, Little Road, Magnum 4024, New York Ave, PressurePro TPMS, Publix grocery stores, pyrometers, shore power, Sloppy Joes (WFPB), Speedometer-odometer, Suncoast Designers (Hudson FL), toad lights, US-19/98, Waste Tanks, water softener, WCRVR (FL), WiFi, WiFi Ranger, Zena power generator on 2014/04/07 by BRF.